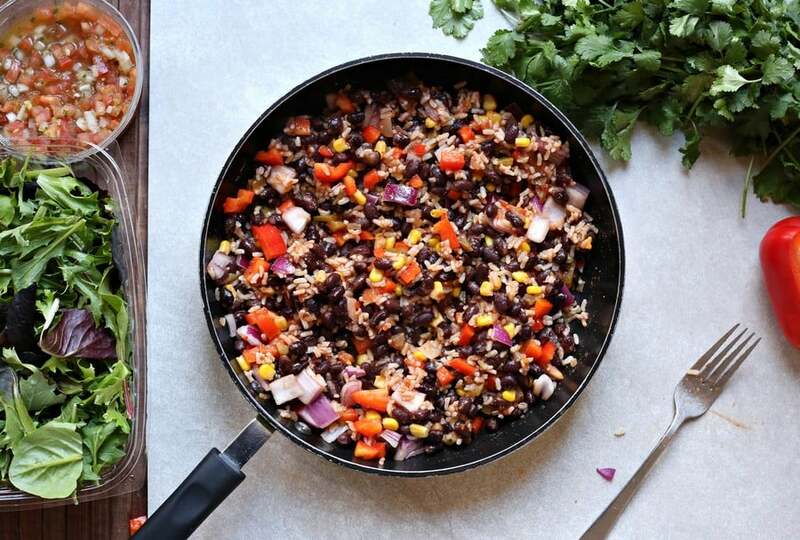 Need an easy healthy vegetarian meal idea that won’t leave you hungry ten minutes later? Our quinoa salad recipe packs a powerful protein punch that leaves you feeling full without weighing you down! I’ve been on a quinoa kick for a while, now. I first tasted it at my brother’s wedding a few years ago. I’ll be honest, I didn’t think I’d like it. While flavor-wise, I’ve never really met a grain I didn’t like, but texture-wise, I am a bit picky. My brother insisted that I taste it, though, and it was instant love. I’m sure you know that quinoa is a super food and pretty much the only grain that’s a complete protein (meaning it has all the essential amino acids that our bodies need), but did you know that people have been eating it for between 3,000-4,000 years? It originated in the Andes region but has been successfully cultivated in parts of the US and Europe. Quinoa is almost always harvested by hand because it’s so delicate. 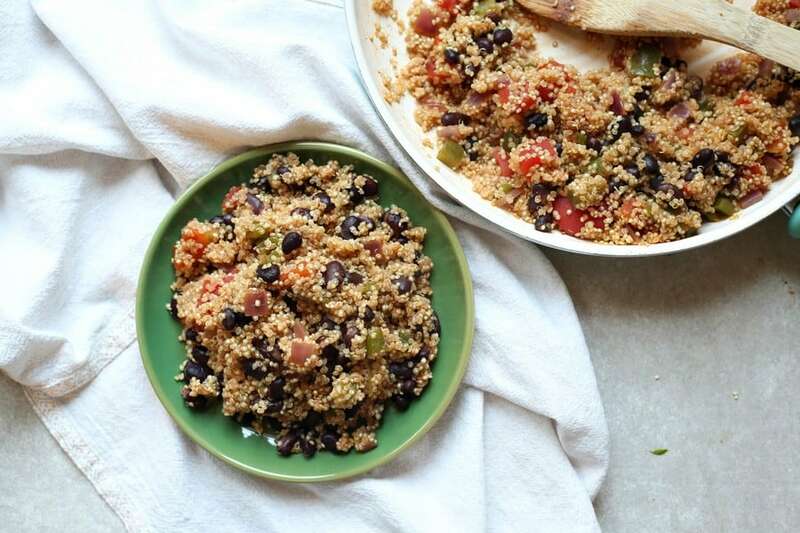 Okay, enough of the history lesson, let’s get onto this delicious vegetarian quinoa salad recipe! Check out the video tutorial first, then print out the recipe card for later! 1.Dice and saute bell pepper and red onion together, along with chili powder and cumin until soft. 2. Add in quinoa, black beans, diced tomatoes, and stock. Stir, then cook covered 15 minutes. 3. Serve with cheese, salsa , or your choice of topping. Dice and saute bell pepper and red onion together, along with chili powder and cumin until soft. Add in quinoa, black beans, diced tomatoes, and stock. Stir, then cook covered 15 minutes. Serve with cheese, salsa, or your choice of topping. While this recipe is perfect for meatless Monday, why stop there? Check out a few of my favorite vegetarian recipes for a Meatless Tuesday through Sunday, too! This is probably theBest Vegetarian Taco Salad you’ll ever taste! It’s crazy easy to make! Plus, if you have leftovers, it tastes great cold the next day in your lunch. 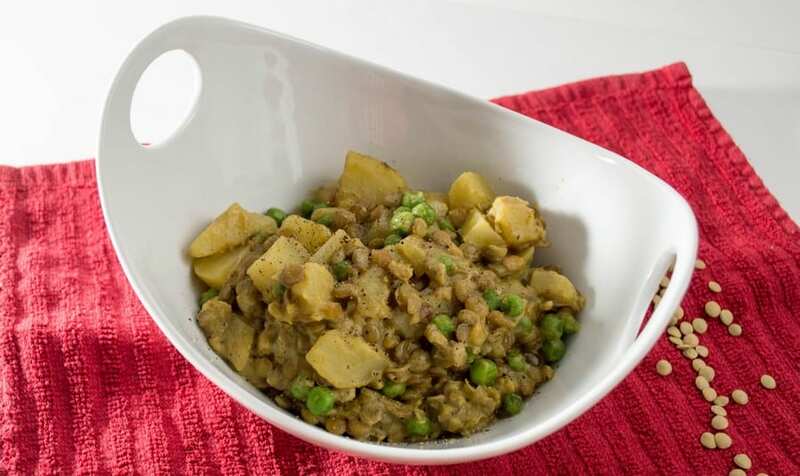 If you love spicy foods, you have to try our Coconut Curry One Pot Lentil! In the mood for something a little more on the Italian side? 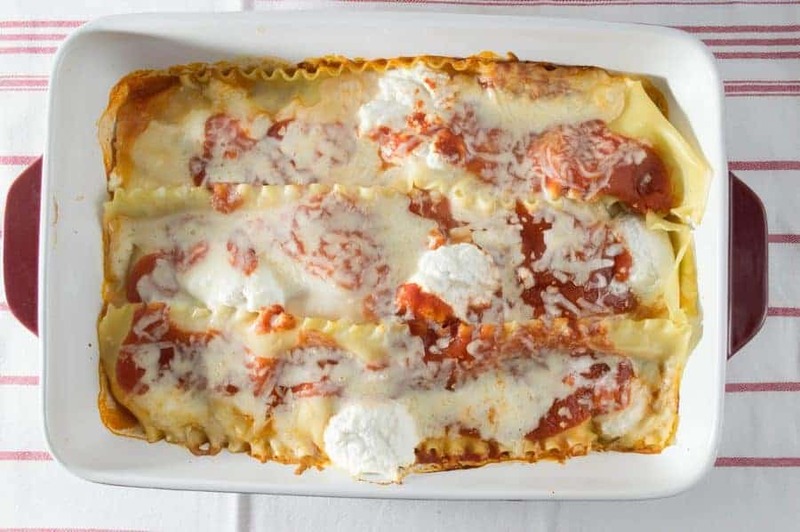 Feed a Hungry Crowd with Our Easy Vegetarian Eggplant Lasagna Recipe! Still need more ideas, especially for your large crowd? 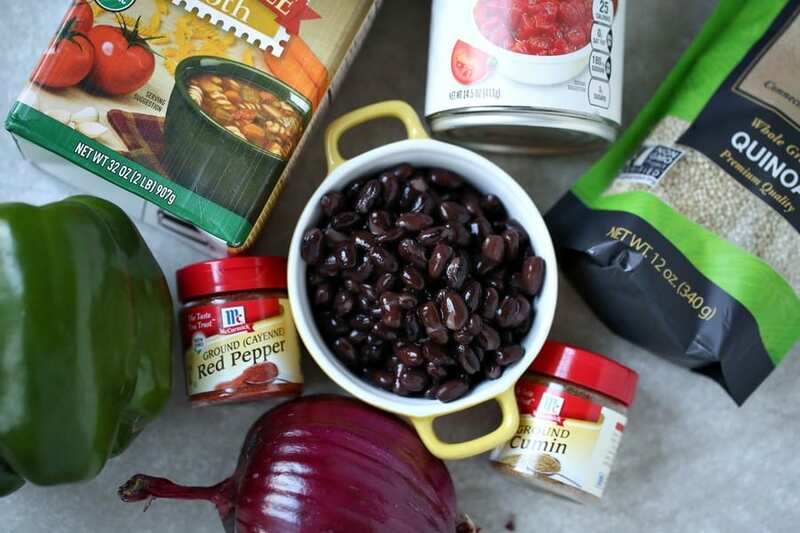 Check out a few of our favorite Cheap Vegetarian Meals For Large Families! Do you have a favorite vegetarian recipe? 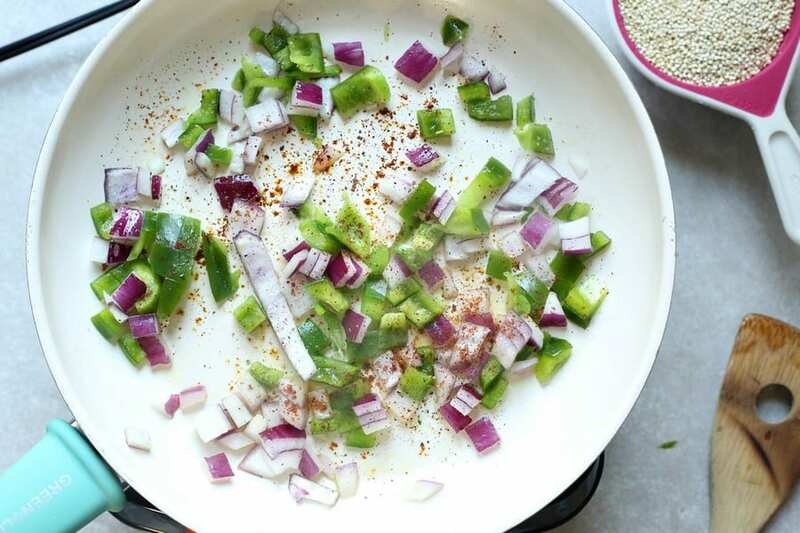 Have you ever made a quinoa salad? What did you put in it? Share below! Throw an Awesome Jungle Themed Movie Night with our Coconut Punch Drink for Kids! This looks soo delicious! I love quiona, I definitely will be trying this out! Love your ingredients – they sound like they’d be so good together! the grains time to absorb the vinaigrette and to let the flavors blend. 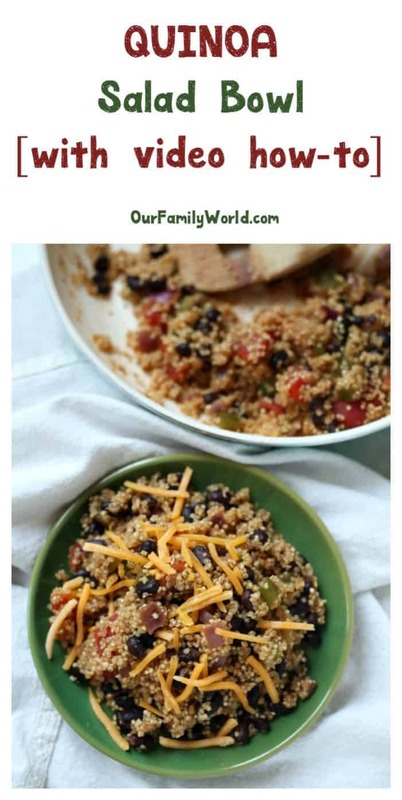 This recipe is awesome – I love eating quinoa! It is a very versatile grain, and you could use it in place of a lot of other grains that you are used to eating – I love how common quinoa is becoming now! This reminds me of a dish I made not to long ago. I used taco season instead, but since it is so hard to find a seasoning pack without a bunch of preservatives using cumin and chili powder sounds like a much idea. This looks delicious! I cannot wait to make this recipe for my family. I am pinning it for later. These looks good! I’m not a huge fan of quinoa but I’m going to check on the coconut lentil curry. It looks yummy! I love spicy food. I’vr never cooked with quinoa before. Not that I don’t like it but it’s rarely available where I live. It would be nice to maoe this especially in the summer. I just rediscovered quinoa the other day and was like : “wow I’ve been missing out!” Will have to give your recipe a try. Thank you! I tried Quinoa for the first time a few weeks ago….and it was good. Thanks for sharing this recipe. I honestly have a ton of quinoa in my cupboard, and I never do anything with it! I am not much of a cook, so I never know what to mix it with. I will have to give this recipe a try. This would be great for a nice healthy lunch.